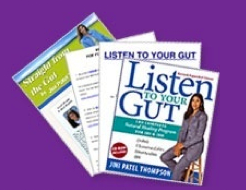 Sign up here to receive Jini's Gut Guide - a 7-Step Mini Course packed with free eBooks and teleseminars. Get a foundational understanding of why the digestive system becomes unhealthy, and how to shift yours to strong, vibrant health. Are you interested in Jini Patel Thompson's books? Get started with Chapter 1 of her flagship book, Listen To Your Gut, along with a comprehensive audio from Jini about what's possible with natural healing for digestive diseases. Yes! I want to get started on healing my gut. I've had enough of pain, ulceration, fatigue, suffering, and I want my life back!